Wanna get your feet wet? Enjoy a relaxing day out at the Causeway Lake, The Sailability Caporicornia organisation operates from the Causeway Lakes boat ramp (the west side of the bridge, near the Coolwaters Holiday Village) every 1st and 3rd Tuesday of every month. 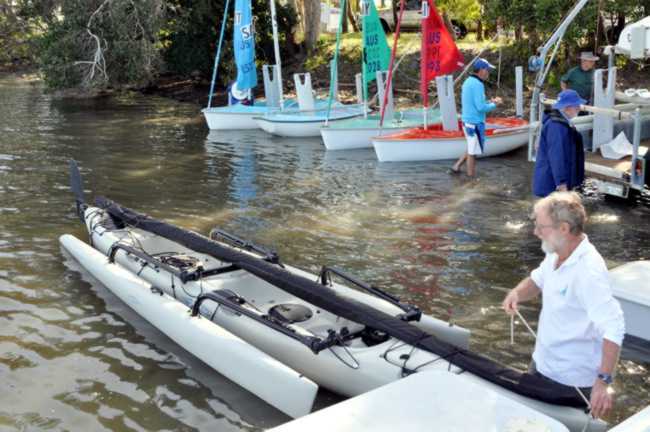 Causeway Lakes “Sailability Capricornia” provides safe sailing for less able members of the community. All ages and abilities are welcome including those who are ill, elderly, disabled or wheelchair bound. Every fortnight a group of passionate volunteers spend a few hours sharing their sailing skills. Specially-made boats with improved stability allow people of all abilities to take to the water for 40 minutes of freedom. As the days heat up, so too do the number of registerations for Capricornia Sailability. Tea and Coffee are available from 10am – 12.30pm, as well as volunteers on land, ‘access’ dinghy’s the day can be as relaxed or as action packed as you wish. Catch a bus (Route 20) grab a shady tree and watch these Mildly Decent craft out on the lake. Author : John Rynne, describes how he feels about sailing with Sailability.